Silver belly bars in lots of unusual and beautiful designs. 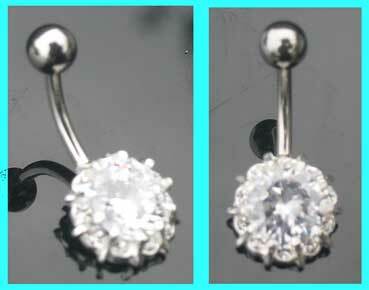 Our range of 925 sterling silver navel rings will let you show off your belly button piercing with style!. Silver belly bars featured in this section have fixed designs, our range includes butterflies and crystal navel rings, unusual flower belly bars and lots more. Our sterling silver belly button piercing range is available with 6mm, 8mm, 10mm or 12mm surgical steel barbells. 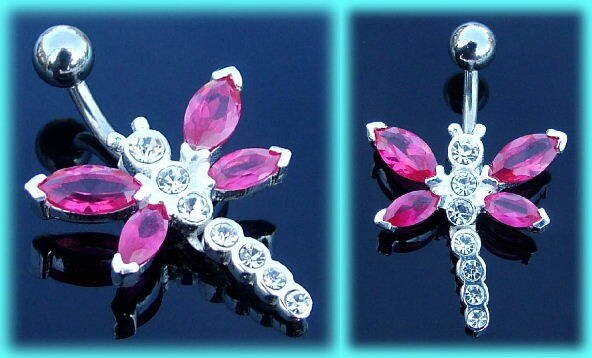 This surgical steel belly bar with a sterling silver dragonfly design is set with fuchsia and clear crystals and has a moveable tail. It is available in a 8mm or 10mm size. The 316L surgucal steel bar is 10mm (3/8") long. 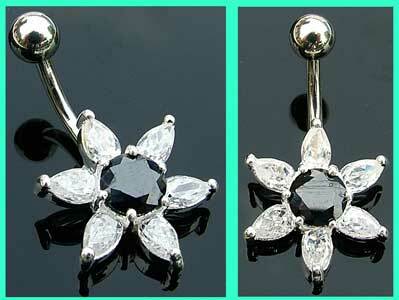 Elegant sterling silver belly bar with a black and clear crystal cluster design. 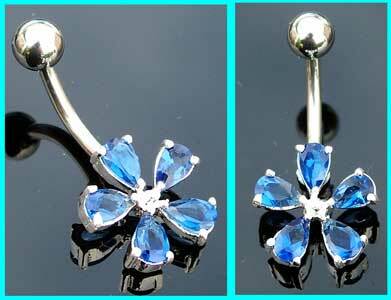 These belly button bars are available with a 8mm (5/16") or 10mm (3/8") 316L surgical steel bar. 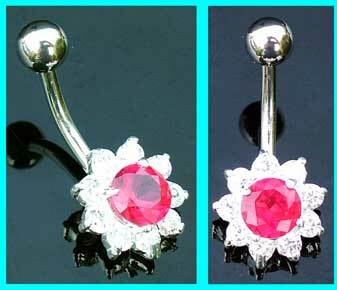 This pretty belly bar has a sterling silver design which is set with three petal shaped clear stones and has a 10mm surgical steel bar length. The three petal flower measures 15mm x 15mm and the 316L surgical steel stem is 10mm (3/8") long. 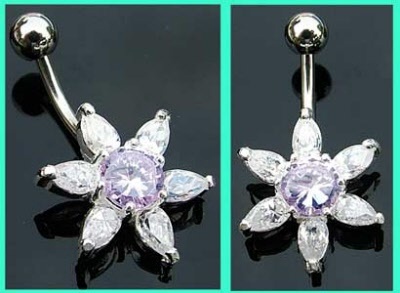 This 10mm surgical steel belly bar features a sterling silver three petal flower design which is set with light pink stones. 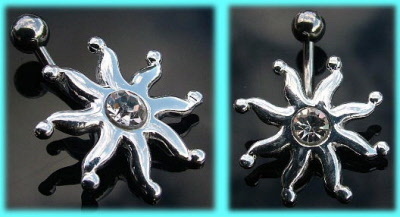 The pretty clear jewelled flower measures 14mm, and these belly button bars are available with either a 6mm, 8mm, 10mm or 12mm surgical steel shaft. 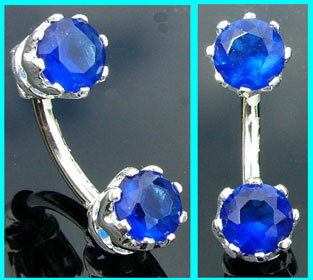 A stylish sterling silver belly bar, with it's dark blue and clear stones, it certainly has a regal look to it! This 8mm surgical steel belly bar features a small sterling silver butterfly design which is set with clear stones. 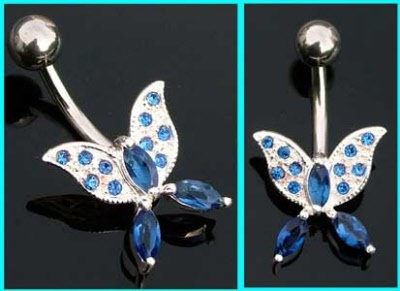 This 10mm surgical steel belly bar features a small sterling silver butterfly design which is set with sapphire blue stones. 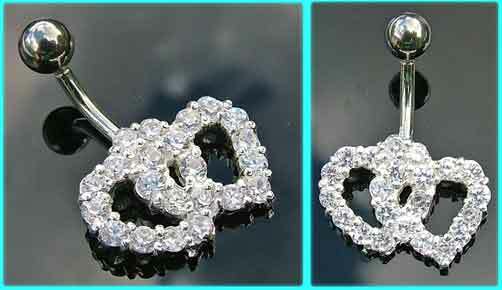 Sterling silver outline heart belly bar with a small light pink crystal. The pretty heart design measures 15mm and the surgical steel shaft is 10mm (3/8") in length. 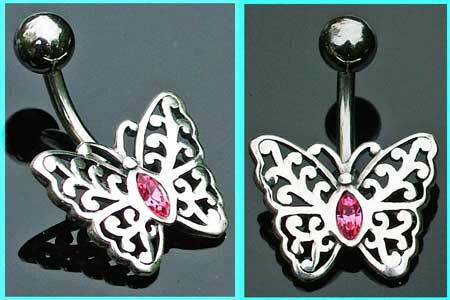 These butterfly belly bars have a large sterling silver design which is set with six clear stones, and has a 10mm (3/8") surgical steel bar. 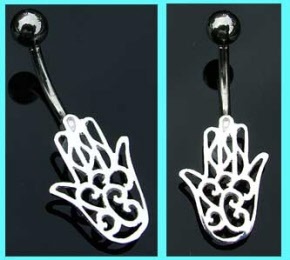 This sterling silver Hamsa Hand belly bar will hopefully bring you happiness, health, lots of luck and good fortune. The delicate 925 silver hand measures 14mm x 18mm and the surgical steel shaft is 10mm *3/8") in length. This silver belly bar features a claw set, pear shaped black jewel at the bottom of a sterling silver twisted design, and has a 8mm surgical steel barbell length. 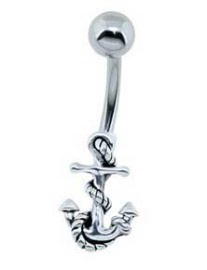 Cute sterling silver anchor belly bar which is set with a small clear crystal. These navel bars are available with a 8mm (5/16") or 10mm (3/8") 316L surgical steel shaft. 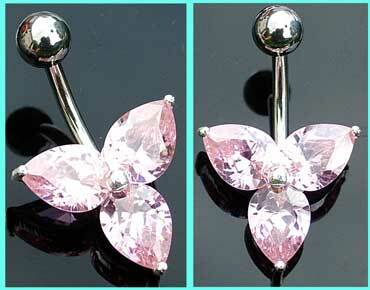 Silver belly bar with a small butterfly design which is set with pink and clear crystals. 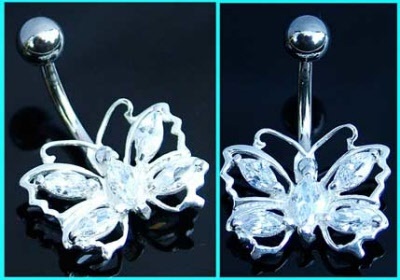 This sterling silver belly bar features a small butterfly design which is set with clear crystals and has a 10mm surgical steel barbell. 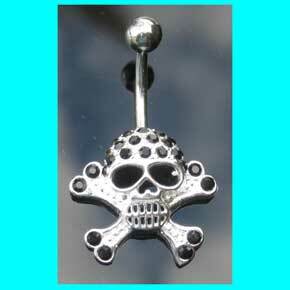 Large sterling silver skull and crossbones belly bar with black crystals and a 10mm (3/8") surgical steel shaft. 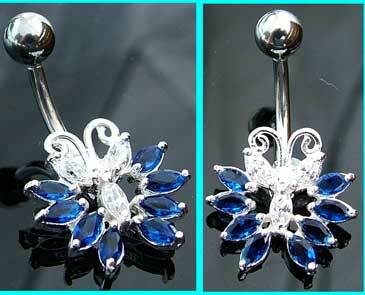 This 10mm surgical steel belly bar features a 925 silver leaf design which is set with clear jewels. 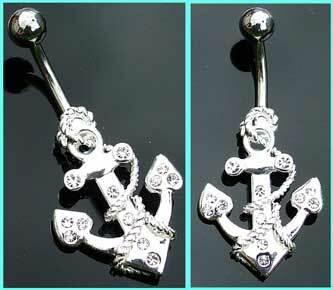 These belly buton bars are available with a 8mm (5/16") or 10mm (3/8") 316L surgical steel bar. 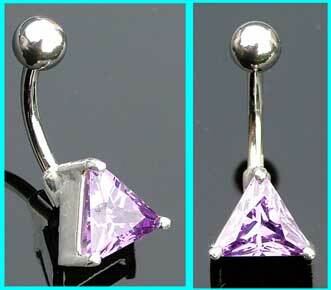 These belly bars are available with a 8mm (5/16") or 10mm (3/8") surgical steel bar. This 925 silver navel bar features a small black crystal teardrop and is available with a 8mm or 10mm surgical steel shaft. This 925 silver navel bar features a small rose crystal teardrop and is available with a 8mm or 10mm surgical steel shaft. This 925 silver navel bar features a small light pink crystal teardrop and is available with a 8mm or 10mm surgical steel shaft. 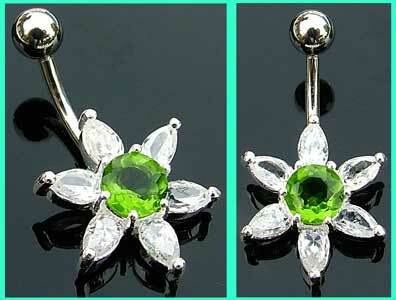 This 10mm surgical steel belly bar features a small sterling silver flower design which is set with clear and green stones. 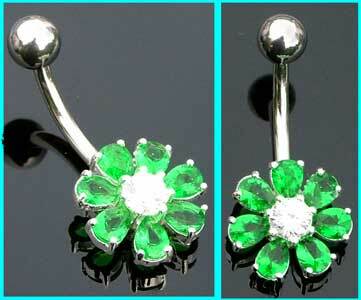 This 10mm surgical steel belly bar features a small sterling silver flower design which is set with light pink, clear and green stones. 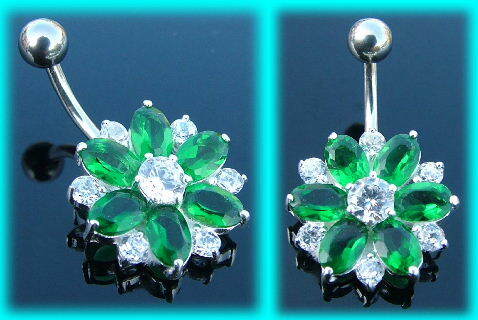 This 10mm surical steel belly bar has a small sterling silver flower design which is set with green and clear stones. 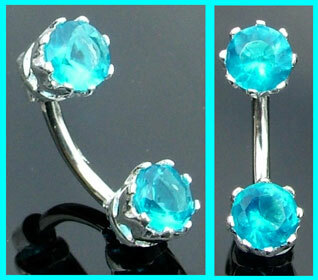 This 10mm surgical steel belly bar features a small sterling silver infinty design which is set with light blue stones. This 10mm surgical steel belly bar features a small sterling silver infinity design which is set with light pink stones. Pretty cluster style navel bar which has a central amethyst colour crystal surrounded by ten smaller clear crystals which are in a sterling silver setting, these belly bars have a 10mm surgical steel bar length. 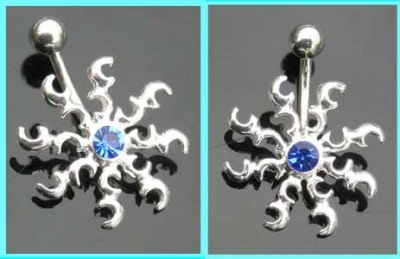 This 10mm surgical steel belly bar features a large sterling silver tribal sun design which is set with a sapphire blue stone. 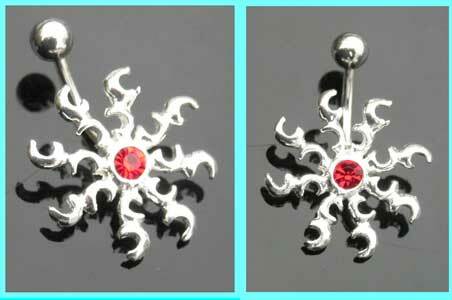 This silver belly bar features a large tribal sun design which has a central red jewl and has a 10mm (3/8") surgical steel shaft. This navel ring has a 10mm (3/8") surgical steel barbell. 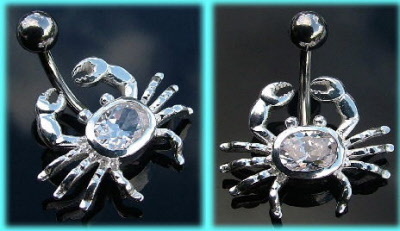 This sterling silver belly bar features a small hand holding a clear jewel, and is available with either a 8mm or 10mm surgical steel bar size. 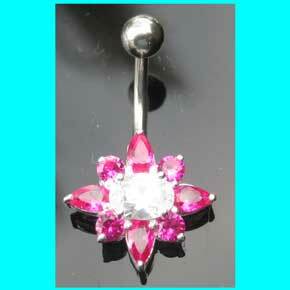 This belly bar is available with either a 8mm, 10mm or 12mm surgical steel shaft. 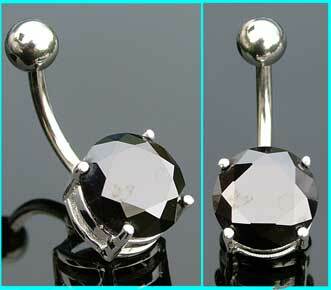 This 10mm surgical steel belly bar features a round black stone which is in a sterling silver setting. 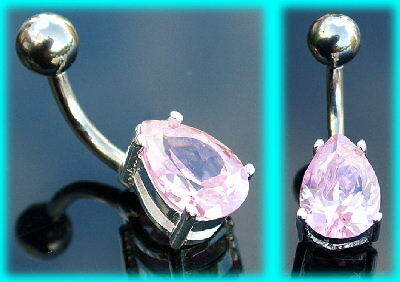 This 10mm surgical steel belly bar features a round light pink stone which is in a sterling silver setting. 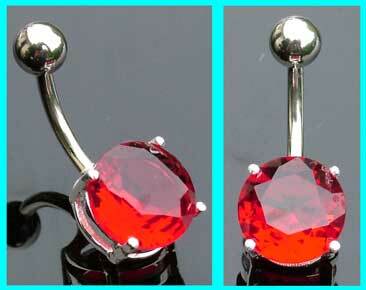 This 10mm surgical steel belly bar features a ruby red stone which is in a sterling silver setting. 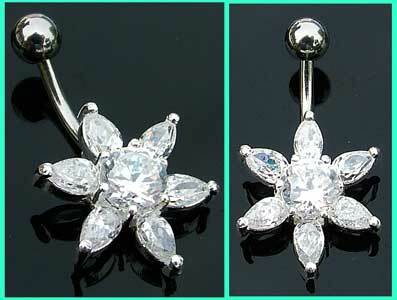 This surgical steel belly bar has a very small sterling silver flower design which is set with clear stones. 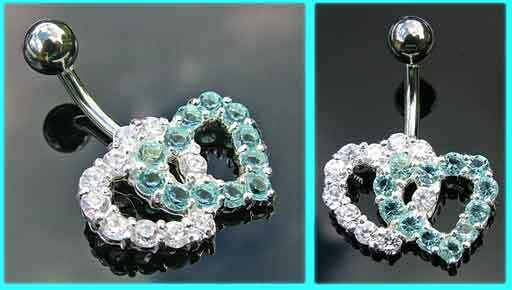 These belly bars are available in a 8mm, 10mm or 12mm size. 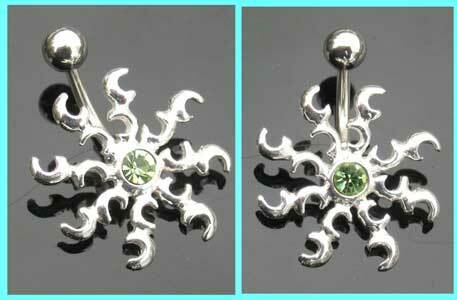 This 10mm surgical steel belly bar features a very small sterling silver flower design which is set with light green and clear stones. 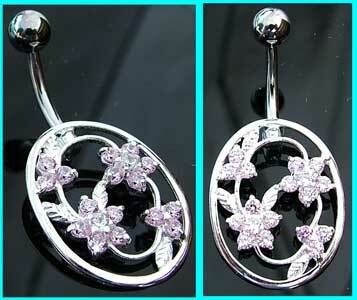 This surgical steel belly bar has a very small sterling silver flower design which is set with rose and clear stones. 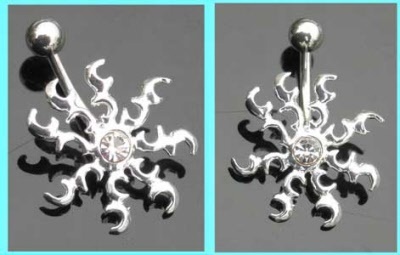 This belly button bar features a cute 925 Silver star design which is set with a single clear stone, and has a 1.6mm (14g) surgical steel bar which is 10mm (3/8") in length. 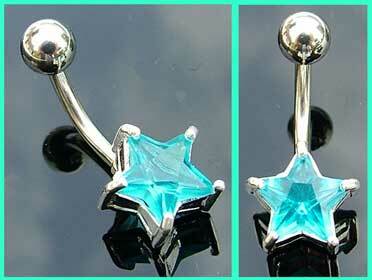 This belly button bar features a small sterling silver star design which is set with a bright blue jewel, and it has a 10mm (3/8") surgical steel barbell. 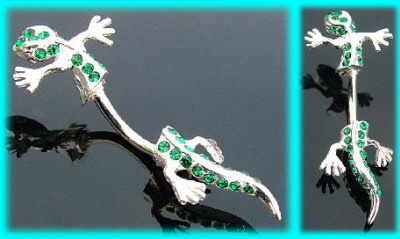 Unusual lizard belly bar with a sterling silver clear crystal gecko design. 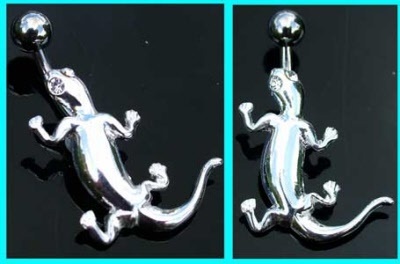 This surgical steel belly bar has a 925 silver spilit gecko design and is available with a 6mm, 8mm, 10mm or 12mm shaft. 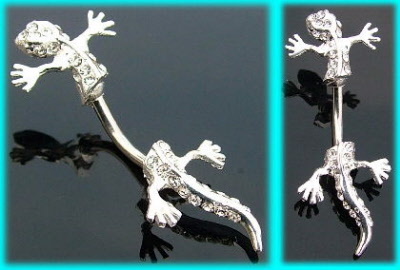 This surgical steel belly bar has a 925 silver split gecko design and is available with a 6mm, 8mm, 10mm or 12mm shaft. These belly button bars are available with either a 8mm or 10mm surgical steel shaft. 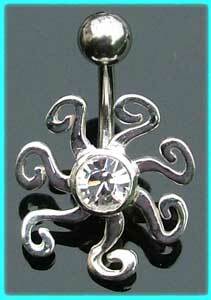 This 10mm surgical steel belly bar features a clear jewel in a sterling silver setting. 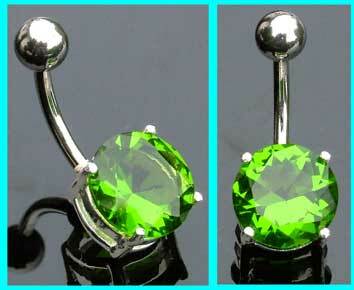 This 10mm surgical steel belly bar features a light green jewel in a sterling silver setting. Featuring a sterling silver scroll design which is set with a pink stone, these belly bars have a 10mm surgical steel bar. Featuring a sterling silver scroll design which is set with a light blue stone, these belly bars have a 10mm surgical steel bar. 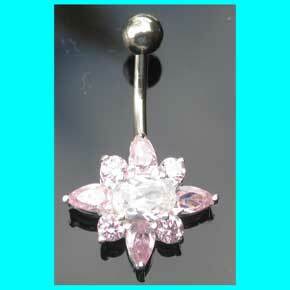 This 10mm surgical steel belly bar has a sterling silver petal design which is set with light pink stones. 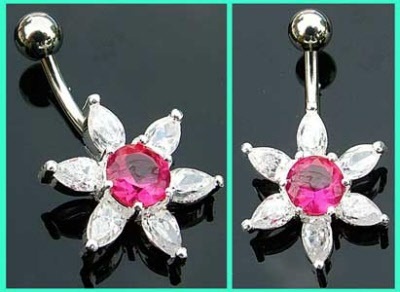 Featuring a sterling silver flower design which is set with fuchsia and clear stones, these belly bars have a 10mm surgical steel bar. 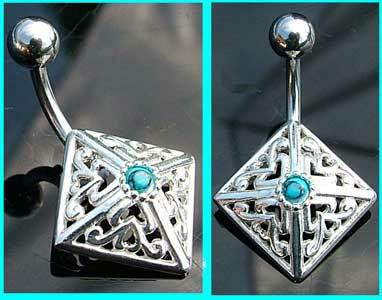 This surgical steel belly bar features a sterling silver celtic design and is available in either a 8mm or 10mm size. 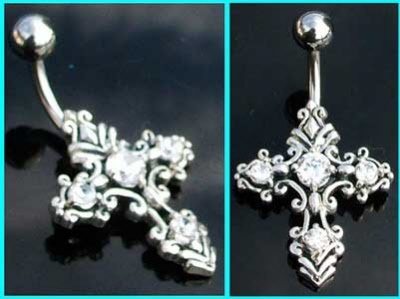 Set with four clear stones, these sterling silver cross belly bars are available with either a 8mm or 10mm surgical steel bar. 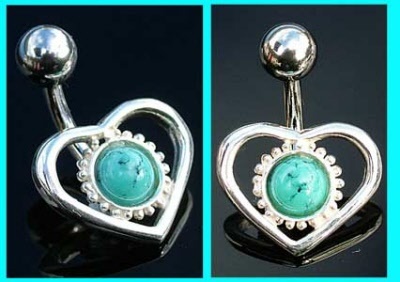 These belly bars have a unuaual sterling silver design which is set with a turquoise stone and are available with either a 8mm or 10mm surgical steel bar. 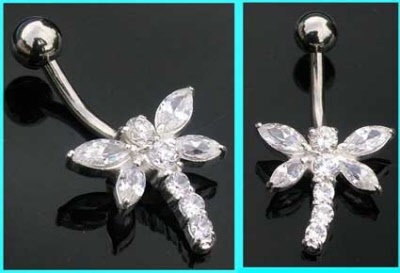 This 10mm surgical steel belly bar features a small sterling silver , seven petal flower design which is set with clear stones. 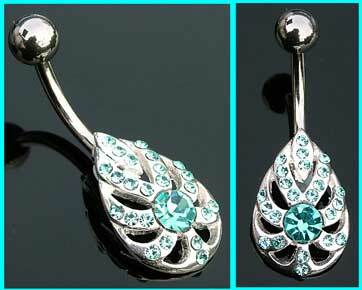 This 10mm surgical steel belly bar features a small sterling silver seven petal flower design which is set with green and clear stones. These navel bars feature a sterling silver butterfly design which has a turquoise stone and they are available with either a 8mm or 10mm surgical steel bar. 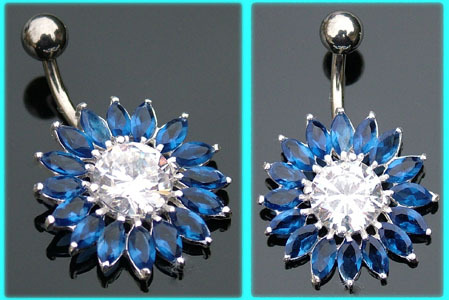 This 10mm surgical steel belly button bar features a sterling silver five petal flower design which is set with sapphire blue stones. 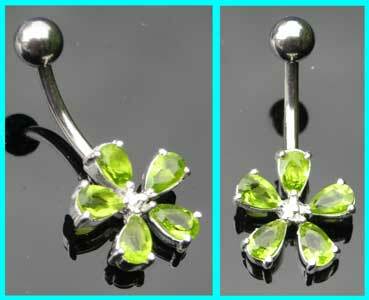 This 10mm surgical steel navel bar has a sterling silver, five petal flower design which is set with light green stones. This 10mm surgical steel belly button bar features a sterling silver five petal flower design which is set with dark green stones. 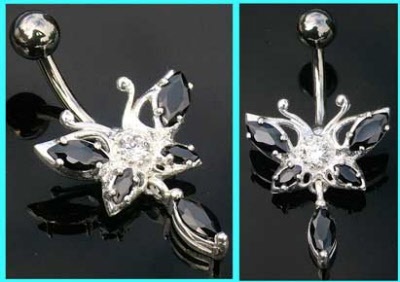 This 10mm surgical steel belly button bar features a sterling silver five petal flower design which is set with black stones. 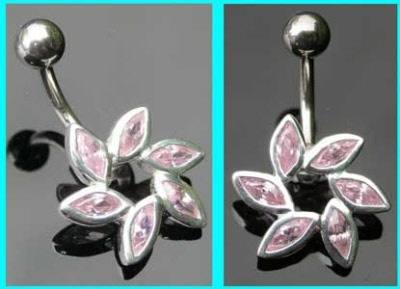 This 10mm surgical steel belly button bar features a sterling silver five petal flower design which is set with rose stones. 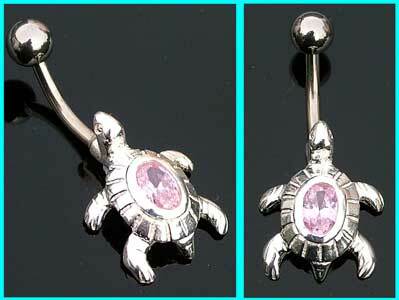 This 10mm surgical steel belly bar features a sterling silver turtle design which is set with a light pink stone. 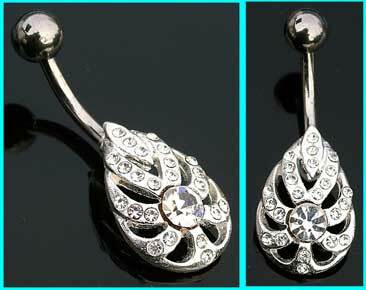 This surgical steel belly bar features a sterling silver celtic pattern flower which is set with a clear stone. 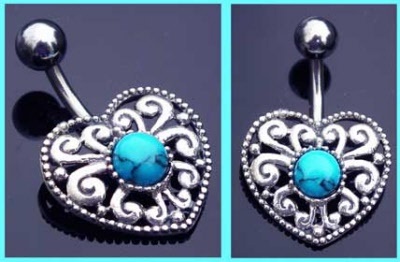 These sterling silver heart design belly bars are set with a turquoise stone and are available with either a 8mm or 10mm surgical steel bar. Due to the nature of the stone, the colour and patternage may vary slightly. 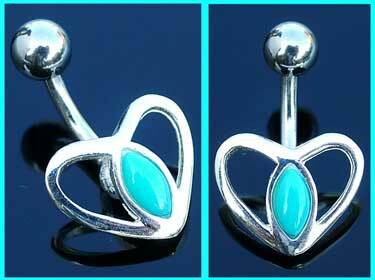 This surgical steel belly bar has a sterling silver heart design which is set with a turquoise stone. Due to the nature of the stone, the colour and patternage of the stone may vary slightly. The heart measure 15mm x 15mm (approx). 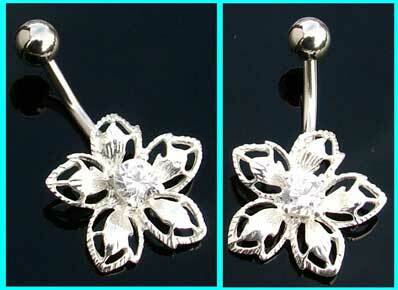 This 10mm surgical steel belly bar features a sterling silver flower design which is set with a clear stone. 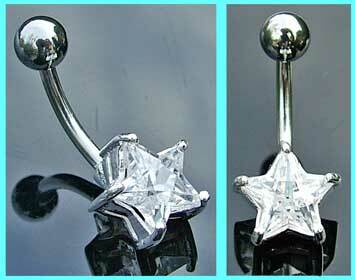 This surgical steel belly bar features a sterling silver hearts design which is set with a clear stone. This 10mm surgical steel belly bar has a sterling silver hearts design which is set with a light pink stone. 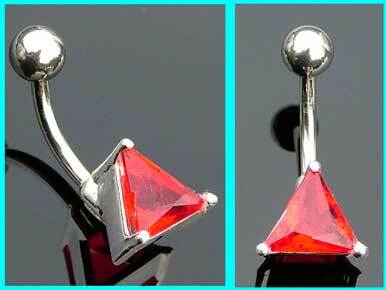 This 10mm surgical steel belly bar has a small red trangular stone which is in a sterling silver setting. The design measures 10mm x 10mm (approx). This 10mm surgical steel belly bar features a small amethyst colour trangular stone which is in a sterling silver setting. 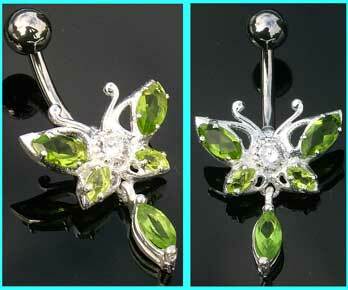 This 10mm surgical steel belly button bar has small sterling silver butterfly design which is set with black stones. 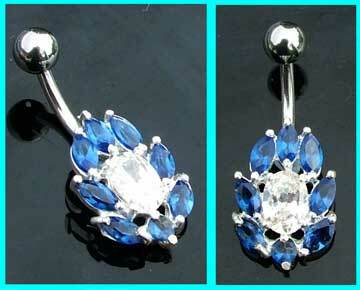 This 10mm surgical steel belly bar has light blue baguette cut stones which are in a sterling silver setting. 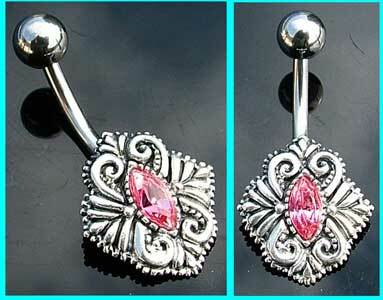 This 10mm surgical steel belly bar features light pink baguette cut stones which are in a sterling silver setting. 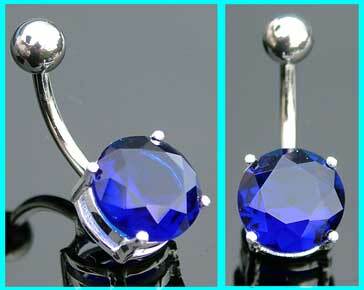 This 10mm surgical steel belly bar has black baguette cut stones which are in a sterling silver setting. This 10mm surgical steel belly bar features a sterling silver butterfly design which is set with black and clear stones. This 10mm surgical steel belly bar features a sterling silver butterfly design which is set with light green and clear stones. 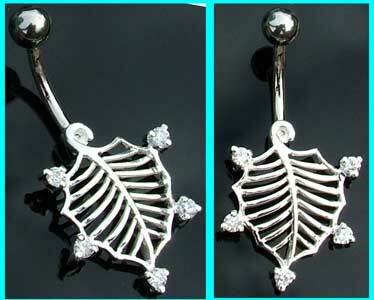 Clear crystal leaf belly bar which is available in two sizes. 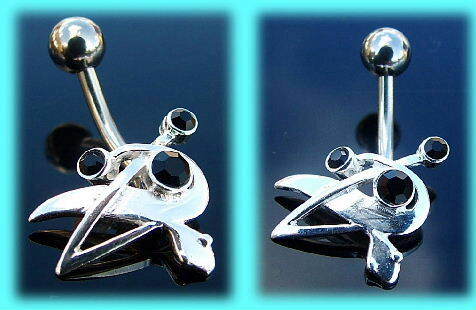 This 10mm surgical steel belly bar features a small sterling silver dragonfly design which is set with rose stones. 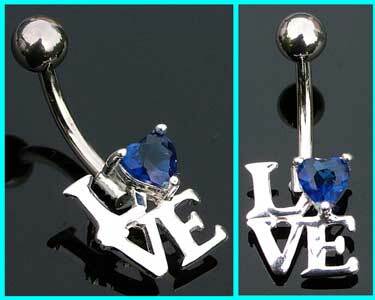 This 10mm surgical steel belly bar features a small sterling silver LOVE design which is set with a sapphire blue stone. 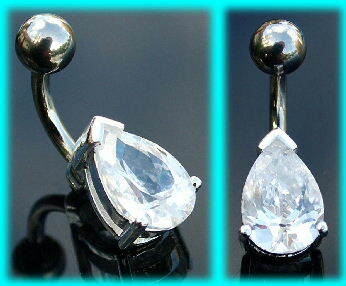 This 10mm surgical steel belly bar features a unusual sterling silver design which is set with two clear stones. 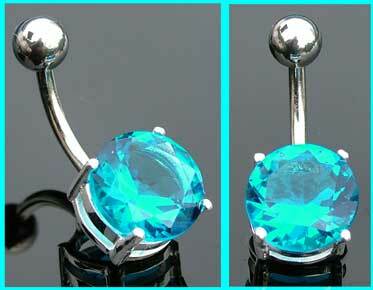 This 10mm surgical steel belly bar has a unusual sterling silver design which is set with two light blue stones. 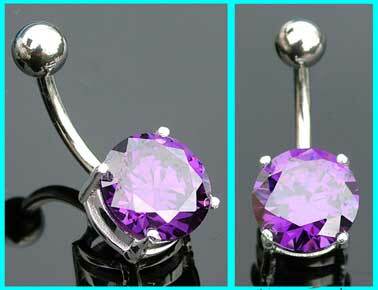 This 10mm surgical steel belly bar has a unusual sterling silver design which is set with two pale lilac stones. 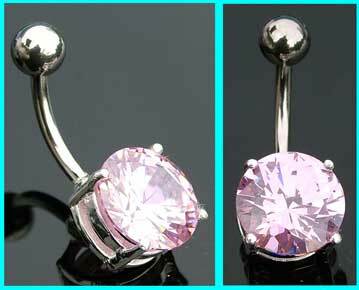 This 10mm surgical steel belly bar features a unusual sterling silver design which is set with two light pink stones. 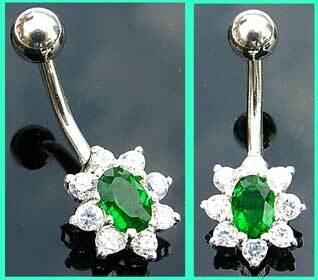 This 10mm surgical steel belly bar has a unusual sterling silver design which is set with two dark green stones. 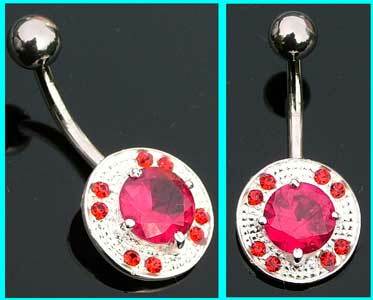 This 10mm surgical steel belly bar features a unusual sterling silver design which is set with two rose stones. 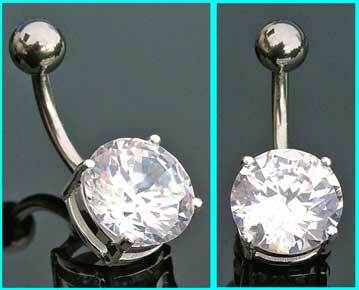 This 10mm surgical steel belly bar features a sterling silver curve design which is set with a light pink oval stone. 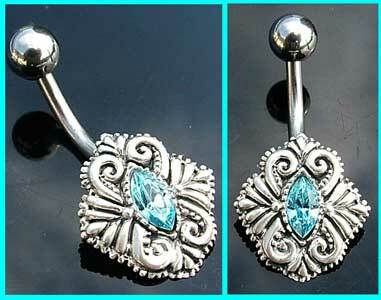 This 10mm surgical steel belly bar features a sterling silver curve design whic is set with a light blue stone. 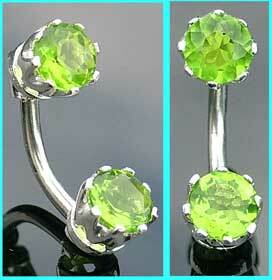 This 10mm surgical steel belly bar features a sterling silver curve design which is set with a green oval stone. 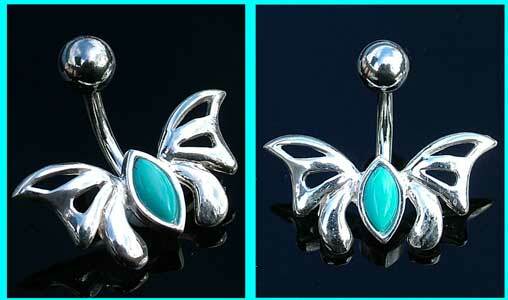 This surgical steel belly bar has a sterling silver butterfly design which is set with two turquoise stones. Funky sterling silver belly bar with a unusual black jewelled, Love inscribed zip. 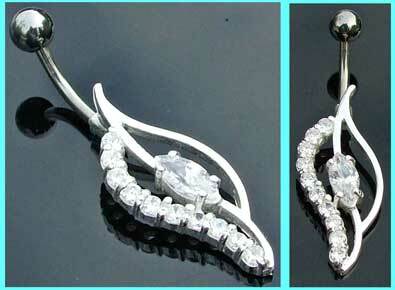 These sterling silver zip design belly bars are set with light blue stones and have a 10mm surgical steel bar. 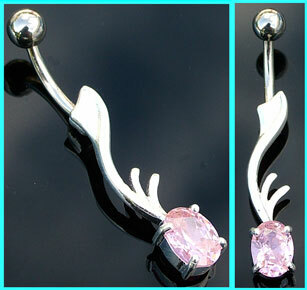 These sterling silver zip design belly bars are set with light pink stones and have a 10mm surgical steel bar. 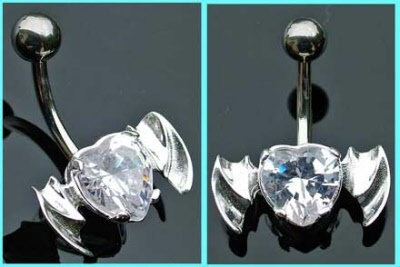 This 10mm surgical steel belly button bar has a sterling silver heart design which is set with three clear stones. 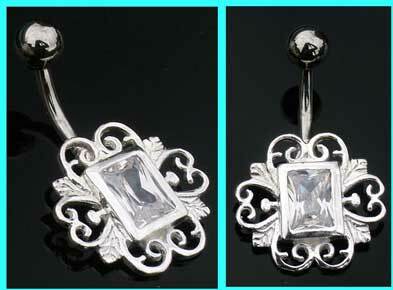 This surgical steel navel bar has a clear crystal which is in a sterling silver setting and a surgical steel, clear jewelled top ball. These navel bars are available in a 8mm or 10mm size. This 10mm black PVD coated surgical steel belly bar features a devil heart design which is set with a clear stone. 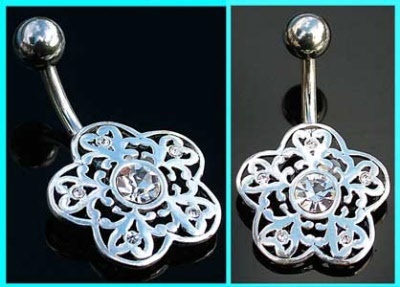 This surgical steel belly button bar has a sterling silver flower design which is set with clear stones and is available with a 8mm or 10mm shaft. 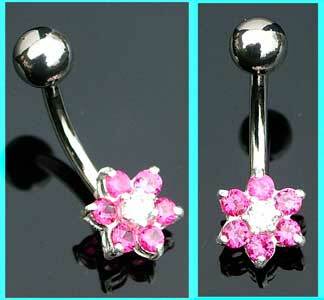 This surgical steel belly button bar has a sterling silver flower design which is set with clear and rose stones. These belly button bars are available in a 8mm or 10mm size. 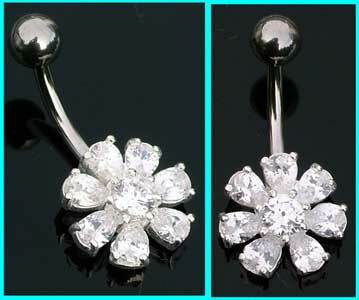 This 8mm surgical steel belly button bar has a sterling silver flower design which is set with black and clear stones. 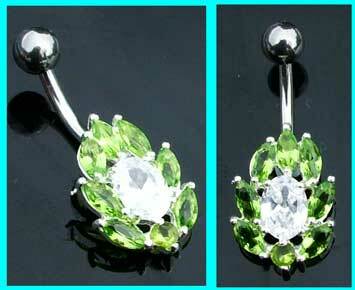 This 8mm surgical steel belly button bar has a sterling silver flower design which is set with green and clear stones. 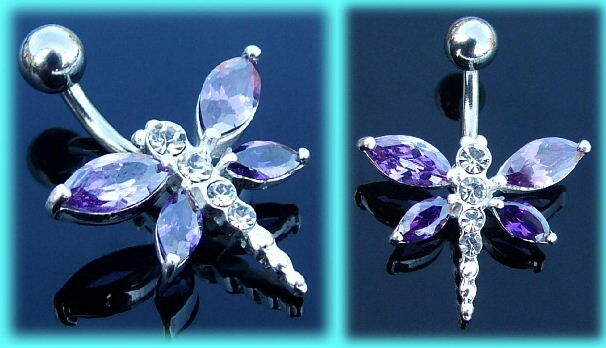 This 10mm surgical steel belly button bar has a sterling silver flower design which is set with clear and lilac stones. 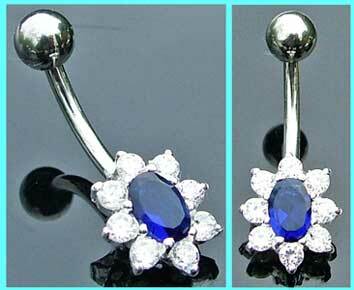 This 10mm surgical steel belly bar has a sterling silver scroll design which is set with a sapphire blue stone. 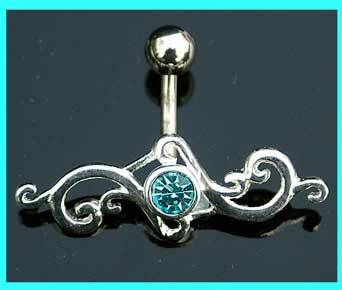 This 10mm surgical steel belly bar has a sterling silver scroll design which is set witha light blue stone. 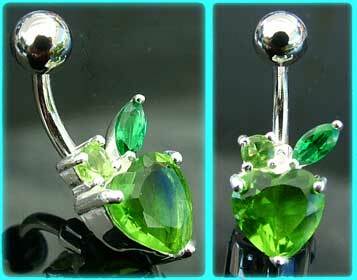 This 10mm surgical steel belly bar features a sterling silver scroll design which is set with a green stone. This surgical steel belly bar has a small sterling silver zombie teddy design and is available in a 8mm or 10mm size. 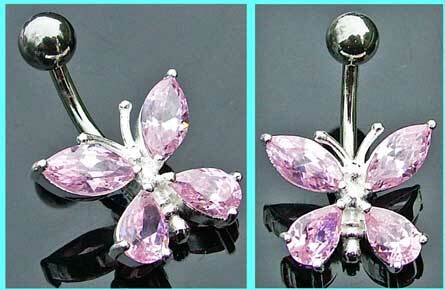 This 10mm surgical steel belly button bar has a sterling silver butterfly design which is set with clear stones. 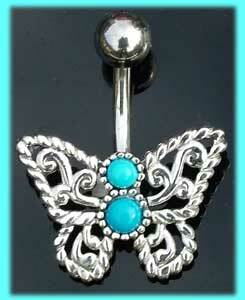 This 10mm surgical steel belly button bar has a sterling silver butterfly design which is set with fuchia stones. 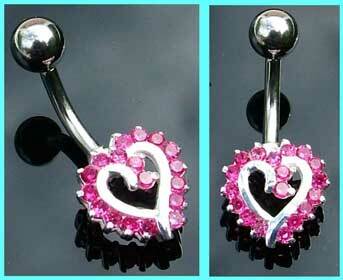 This 10mm surgical steel navel bar has a sterling silver heart design with clear droplets. This 10mm gold PVD coated surgical steel belly bar features a devil heart design which is set with a clear stone. 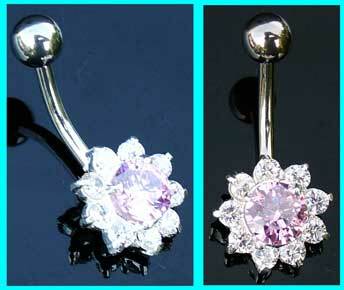 This gold PVD coated surgical steel belly bar has a devil heart design which is set with a light pink stone. This 10mm surgical steel belly button bar features a sterling silver winged heart design which is set with a clear stone. 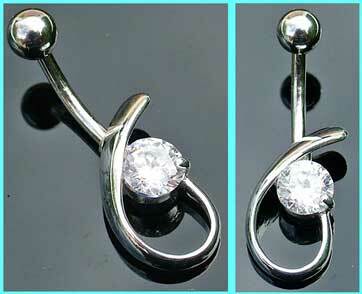 This surgical steel belly bar has a clear jewelled, sterling silver swirl design and is available in a 8mm or 10mm size. 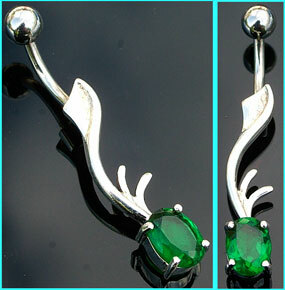 This 10mm surgical steel belly bar has a small sterling silver leaf design which is set with green stones. 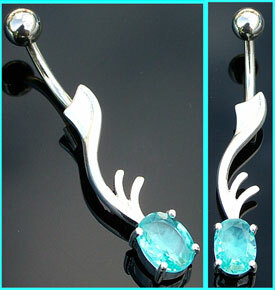 This surgical steel belly bar has a sterling silver heart design which is set with a turquoise stone. 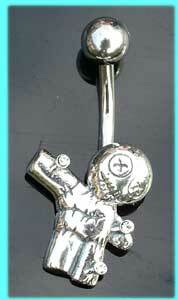 This surgical steel belly bar has a sterling silver voodoo doll design and is available in a 8mm or 10mm size. 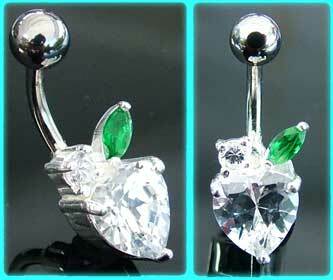 This surgical steel belly bar has a small sterling silver heart design which is set with clear stones. 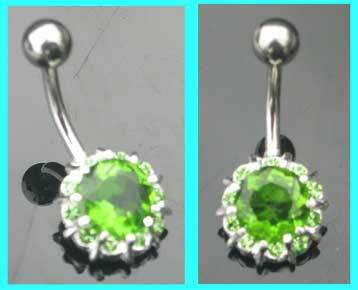 These belly bars are available in a 10mm or 12mm size. 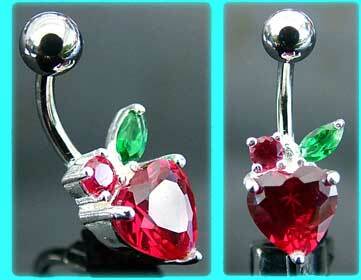 This surgical steel belly bar has a small sterling silver heart design which is set with rose stones. 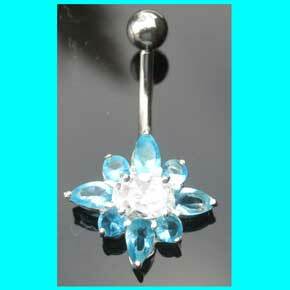 This 10mm surgical steel belly bar has a sterling silver teardrop design which is set with light blue stones. 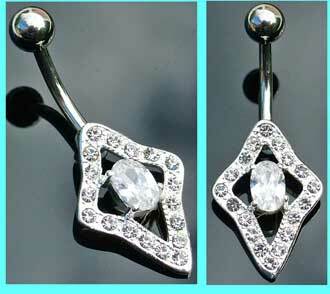 This 10mm surgical steel belly bar has a sterling silver diamond design which is set with clear stones. 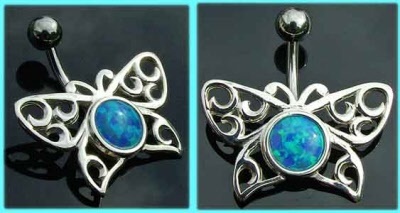 This surgical steel bellybar has a sterling silver butterfly design which is set with a blue opal. 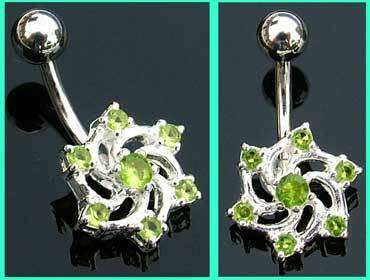 This 10mm surgical steel belly bar has a sterling silver swirl design which is set with green stones. The swirl design measures 10mms (approx). 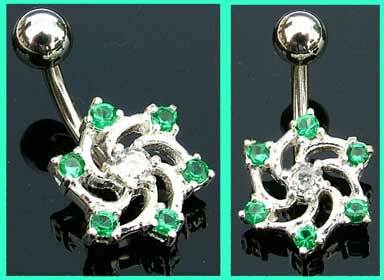 This 10mm surgical steel belly bar has a sterling silver swirl design which is set with light green stones. 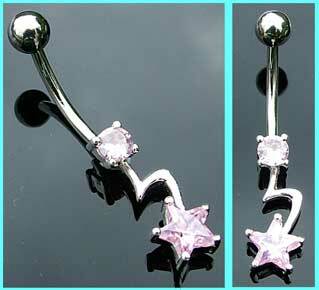 This 10mm surgical steel belly bar has a sterling silver star design which is set with two pale pink stones. 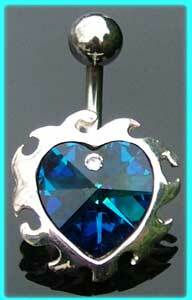 This 8mm surgical steel belly bar has a sterling silver heart design which is set with light blue stones. 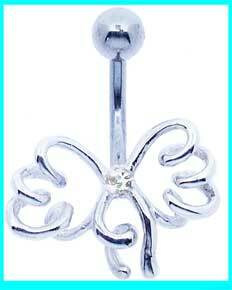 This 10mm surgical steel belly bar has a sterling silver butterfly which is set with clear stones. 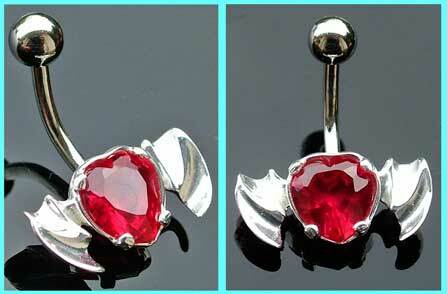 This 8mm surgical steel belly bar has a sterling silver butterfly design which is set with rose red stones. 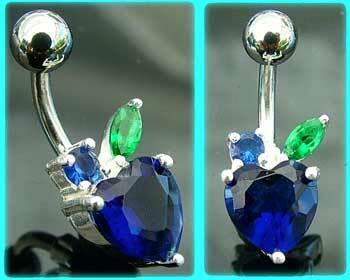 This surgical steel belly bar has a sterling silver heart design which is set with a blue crystal. 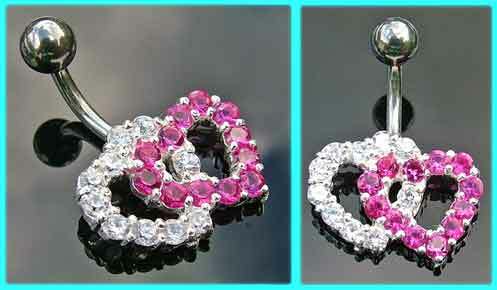 These heart belly bars are available in a 8mm or 10mm size. 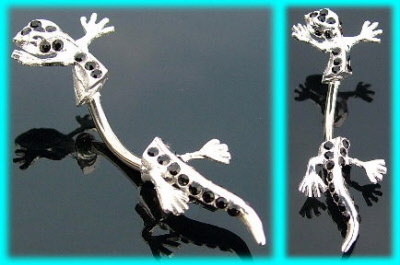 This a surgical steel bar with a sterling silver fish design which is set with clear and black stones. This is a surgical steel bar with a sterling silver fish design which is set with red and black stones. This is a surgical steel bar with a sterling silver fish design which is set with black and red stones. 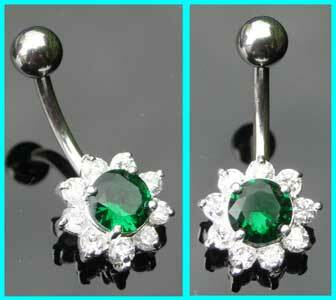 This is a surgical steel belly bar with a sterling silver flower design, which is set with dark green and clear crystals. 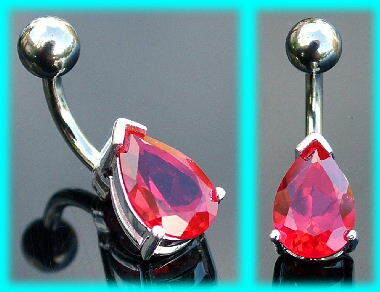 These belly bars are available in an 8mm or 10mm size. 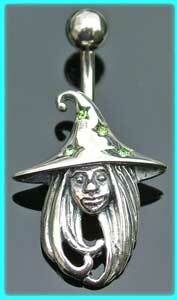 This is a 8mm surgical steel bar with a small, sterling silver zombie girl design which is set with blue stones. The doll design measures 15mm. This is a surgical steel bar with a small, sterling silver teddy design. This is a surgical steel bar with a little sterling silver, zombie boy design. The little boy measures 15mm (approx). This is a surgical steel belly bar with a small, sterling silver stitched up teddy design. 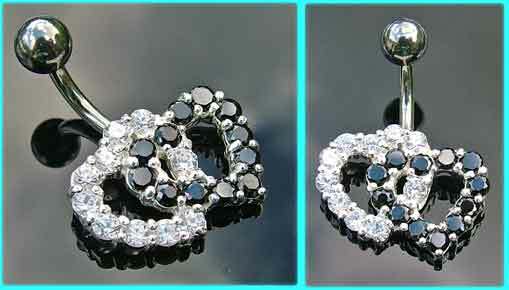 Theses belly bars are available in a 8mm or 10mm size. This is a surgical steel bar with a sterling silver, entwined hearts design which is set with clear and pink stones. 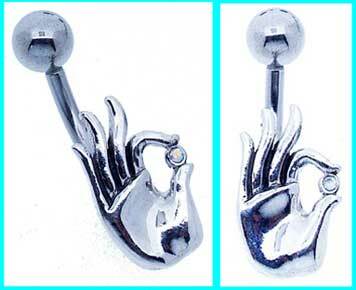 These sterling silver belly bars are available in a 8mm or 10mm size. 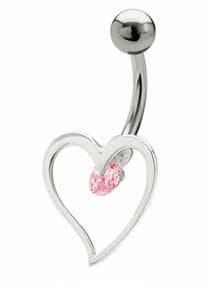 This is a surgical steel belly bar with a sterling silver, entwined hearts design which is set with clear and light pink stones. 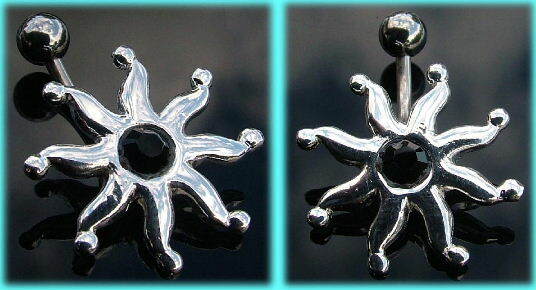 These sterling silver belly button bars are available in a 8mm or 10mm size. This is a surgical steel belly bar with a sterling silver, entwined hearts design which is set with black and clear stones. This is a surgical steel belly bar with a sterling silver, entwined hearts design which is set with clear and light blue stones. A sterling silver entwined hearts design belly bar which is set with clear stones. 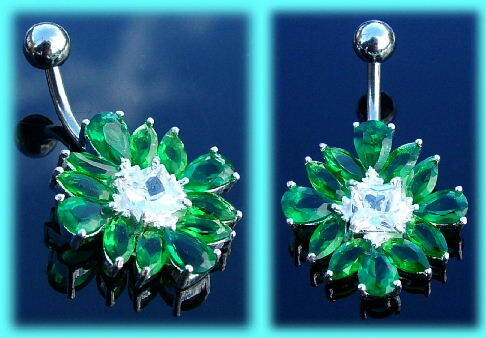 This is a 10mm surgical steel belly bar with a crystal flower design. 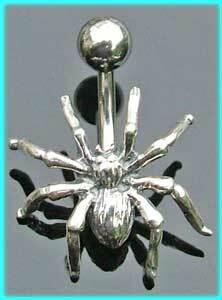 This is a surgical steel belly bar with a sterling silver spider design. 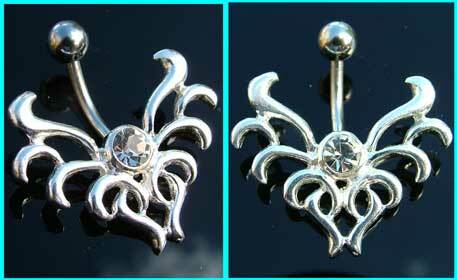 This is a surgical steel belly bar with a small, sterling silver fairy design. 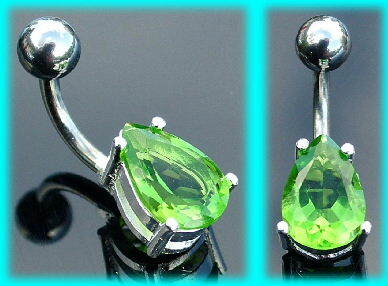 This is a surgical steel belly bar with a sterling silver witch design which is set with light green stones. 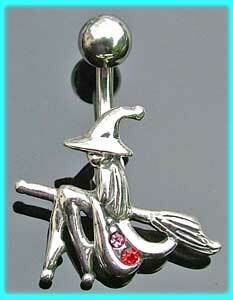 This is a surgical steel belly bar with a small, sterling silver witch on a broomstick design. 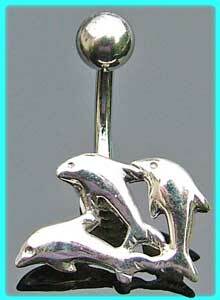 This is a 8mm surgical steel belly bar with a sterling silver design which features three dolphins. 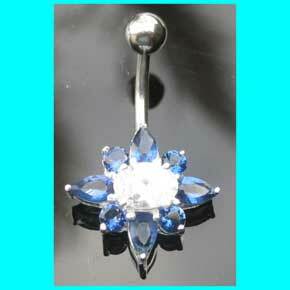 This navel bar has a 10mm surgical steel shaft. 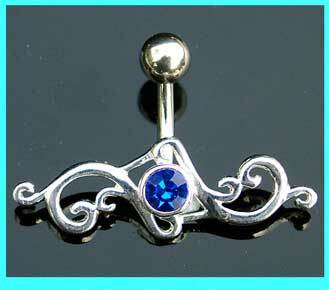 This navel bar is available with a 8mm or 10mm surgical steel shaft. 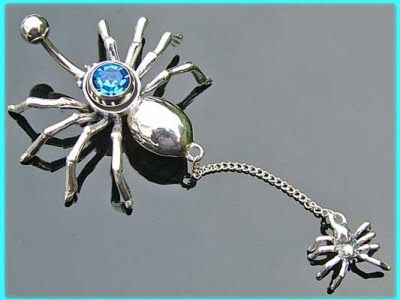 This is a 10mm surgical steel blue jewelled belly bar with a large, removeable sterling silver belly bar surround, which features a large spider and a smaller spider which hangs from a chain. These spider surrounds can be used with any standard 1.6mm gauge bar. 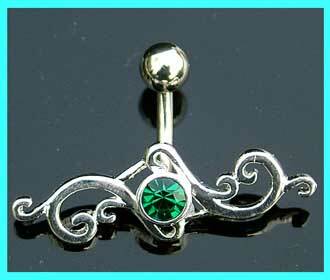 This 9mm surgical steel belly bar features a sterling silver serpent design which is set with a black stone. 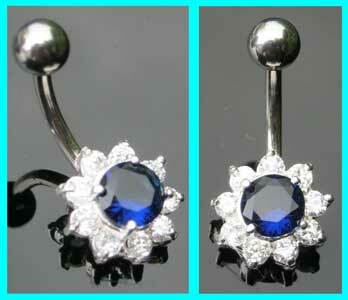 Stunning belly bar with a large flower design. This is a surgical steel bar with a large, sterling silver flower design which is set with dark green and clear jewels. 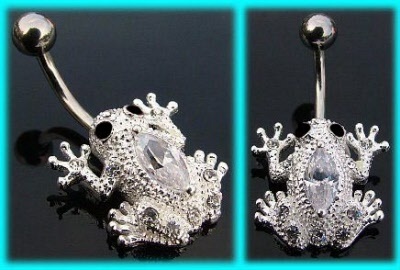 Cute frog belly bar with a sterling silver design set with clear crystals, which is available with a 8mm (5/16") or 10mm (3/8") surgical steel shaft. 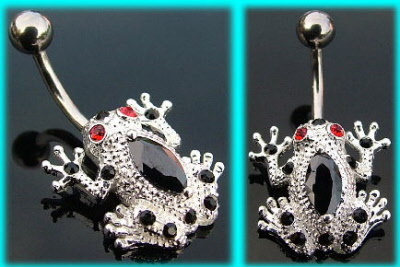 This is a surgical steel belly bar with a small, sterling silver frog design which is set with black and red crystals. 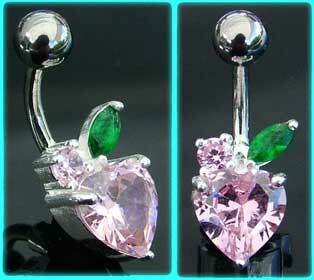 This is a 10mm surgical steel navel bar with a sterling silver heart design which is set with light pink crystals. 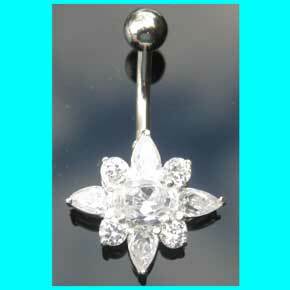 This is a 12mm surgical steel navel bar with a sterling silver leaf and heart design which is set with clear crystals. 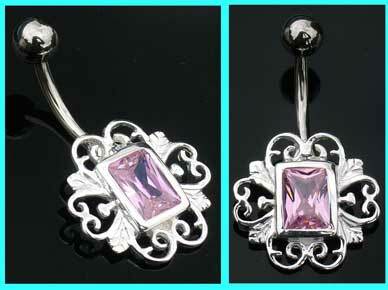 This is a 10mm surgical steel belly bar with a sterling silver leaf and heart design which is set with lilac crystals. 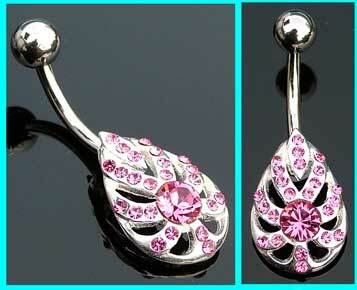 This is a 10mm surgical steel belly bar with a sterling silver leaf and heart design, which is set with pink crystals. 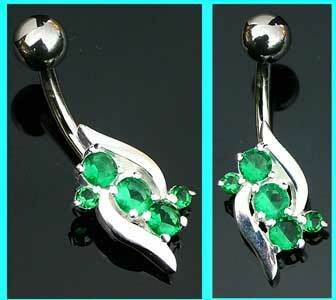 This is a 10mm surgical steel belly bar with a sterling silver design which is set with dark green and clear crystals.